See an updated version of this post on The Leaf Online,Cannabinoid Profile – CBC! Cannabichromene is a little understood non-psychoactive cannabinoid that has recently been seeing a lot more research. Like THC and CBD, CBC is an end product of CBG being processed into CBGa, and then into new cannabinoids. As a result, CBC has the same chemical formula and weight as CBD and THC but they all have a different configuration of the molecules. The lack of research hasn’t stopped it from being patented for various uses, recognizing its wide range of medical uses. CBC is an analgesic and anti-inflammatory, like THC and CBD though less potent. CBC is anti bacterial and CBCa has been shown to be an antifungal agent. Like CBD, cannabichomene is both a bone stimulant and neurogenic compound, helping grow both body and mind. Perhaps its most important use is as an anti-proliferative, slowing tumor growth and combating cancer, just like CBD and THC. CBC has also been shown to be ten time as powerful as CBD at reducing anxiety and stress. Neurogenesis – Promotes the growth of new brain cells. Analgesic: While only a study on rats, CBC was been shown to have great promise as an analgesic painkiller, perhaps as good as CBD. Anti-Inflammatory: In two other recent studies on rats CBC was shown to be a powerful anti-inflammatory. Interestingly it was found that the mechanism of action did not involve CB1, CB2, or the TRPA1 receptors, like with THC and CBD; this is certainly worth more research as it could imply another type of receptor site is present. Neurogenesis: A study done last year confirms that CBC stimulates bone growth. As neurogenic compounds are very rare this makes CBC a very important cannabinoid worth significant research. This could make CBC useful in treating the Alzheimer and other neurodegenerative conditions, but that will need more research. I am not a doctor, and even the doctors don’t know what strains are best for which conditions. That being said, from what I could find online it appears that some patients with gastroparesis use Marinol to treat it. Marinol is pure synthetic THC, so that means any strain that has a lot of THC should work best. 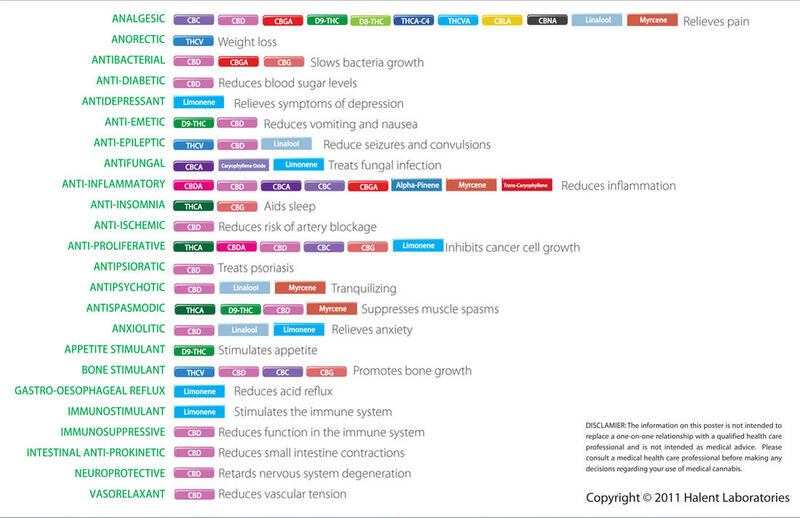 This is good for you since the majority of the medical cannabis market is THC-based.